(TBILISI)--TAV Georgia, an affiliate of a global aviation brand managing Tbilisi and Batumi international airports in Georgia, says that Georgian Airways, also known as Airzena, is “misinforming and misleading public” when it says that it is impossible to make air tickets cheaper due to the high service fee paid to TAV Georgia. The Georgian Airways has already announced a rally to make TAV Georgia leave the country, as the companies could not reach an agreement. Responding to Airzena, an official statement released by TAV Georgia this week reads that according to the International Civil Aviation Organization 2017 Economic Development Report, ticket costs cover only 25 percent of the airport service costs [security, terminal, ground handling, aerodrome and landing-takeoff service fees, and most of these services are provided by the Georgian Airways itself] while the remaining 75 percent are the air company’s main expenditures. TAV Georgia gave an example of a few flights performed by Georgian Airways and other – foreign airlines from Tbilisi international airport to the same destinations. “The cost of the ticket to Moscow and Kiev is much higher with Georgian Airways than with Aeroflot, Pobeda and Ukraine International Airways. It should be mentioned here that the foreign airlines do not have special discounts as Georgian Airways does, even more to that, as different from them, these air companies get all the ground handling serviced for their flights from TAV Georgia,” TAV Georgia says. They claim that in the case of Georgian Airways the share of TAV out of the round trip ticket cost (arrival-departure) makes 33$ on average. TAV Georgia says that Georgian Airways has been benefiting more than 50% discount for services on request. “Besides considerable discounts based on agreement made up with TAV Georgia and Georgian government, Georgian Airways was granted with the right to perform ground handling services to its own aircraft and passengers, thus enabling them decrease the operational expenses of the company. “In addition, since last year there has been a special tariff set for take-off/landing of aircraft belonging to the Tbilisi-based airlines, depending on the number of the flights performed by them, implying a 20 percent discount that Georgian Airways benefits from as well,” TAV Georgia says. TAV states that “aiming at supporting development of domestic flights”, since 2010, they have been using a special tariff for the companies that perform domestic flights and that Georgian Airways has been “given the opportunity” to significantly decrease its expenses on domestic flights. Georgian Airways says that TAV Georgia is the main “culprit” why they cannot make tickets cheaper and add some new flights. “Over the past five years, only to allow to our consumers walk from a terminal to their plane, we paid the Turkish company TAV Georgia more than 43 million GEL,” the Georgian Airways says. “Only in the last year we paid more than 15 million GEL for the service to our 182, 506 passengers,” Airzena statement reads. 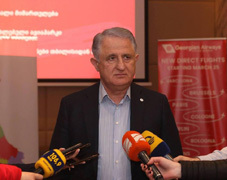 The head of Georgian Airways Tamaz Gaiashvili called on the public to join their protest in the week and make the company leave the country. TAV Georgia is a daughter company of TAV Airports Holding. It started its operation in Georgia in 2005 and, based on the deal with the government of Georgia, will continue its activity until 2027.